Herb Cohen, the best negotiator in the world, is on the Negotiations Ninja Podcast! 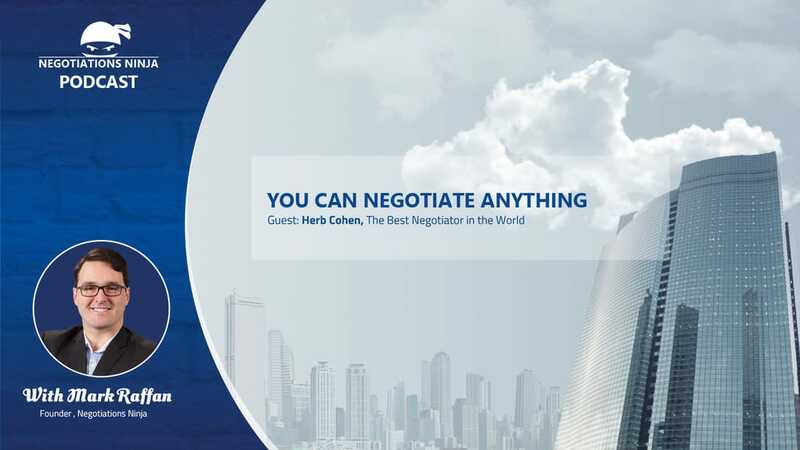 Cohen is an expert negotiator and strategy consultant in commercial and crisis negotiations. He is also the author of two amazing books, including the New York Times bestseller You Can Negotiate Anything (the fifth bestselling audio book of all time). Washington Post Columnist Jack Anderson wrote this quote about Herb Cohen: “To help get our fifty-two hostages back from Iran, the Carter Administration called upon Herb Cohen, an internationally respected negotiator. He not only told Jimmy Carter’s people what they were doing wrong–while they were doing it–but predicted the release of the hostages almost to the exact hour….On the other hand, Ronald Reagan responded as Cohen recommended, and the Iranian’s reacted as Cohen predicted–on the exact deadline he had foreseen.” This hostage crisis was memorialized in the film Argo. Larry King (Herb Cohen’s best friend) even wrote about “Herbie’s” negotiating skills as a child.